i wrote a top-level forms UI language with which i generate code for another language i wrote. So i m really doing a model2model transformation. However i have a serious problem with the $LOOP$. The $LOOP$ get s a list of nodes as input and executes it s body then. But what, if i have concept "label" as input of a $LOOP$ and should generate TWO concepts "table.column" for each input node. E.g. on the attached picuter, i highlighted two nodes. It would be perfect, if i could put a $LOOP$ over both nodes. But that s not possible. Did i miss something? is that a general model2model problem? Loop's functionality is not good for your requirement. Use the COPYSRCL to copy a list of nodes from your input model to this place. Then use a reduction rule to reduce each node to e.g. 2 output-nodes. thanks for your support. However, problem stays the same when following your approach. You will get (the same) a problem with the Template-Fragment macro. 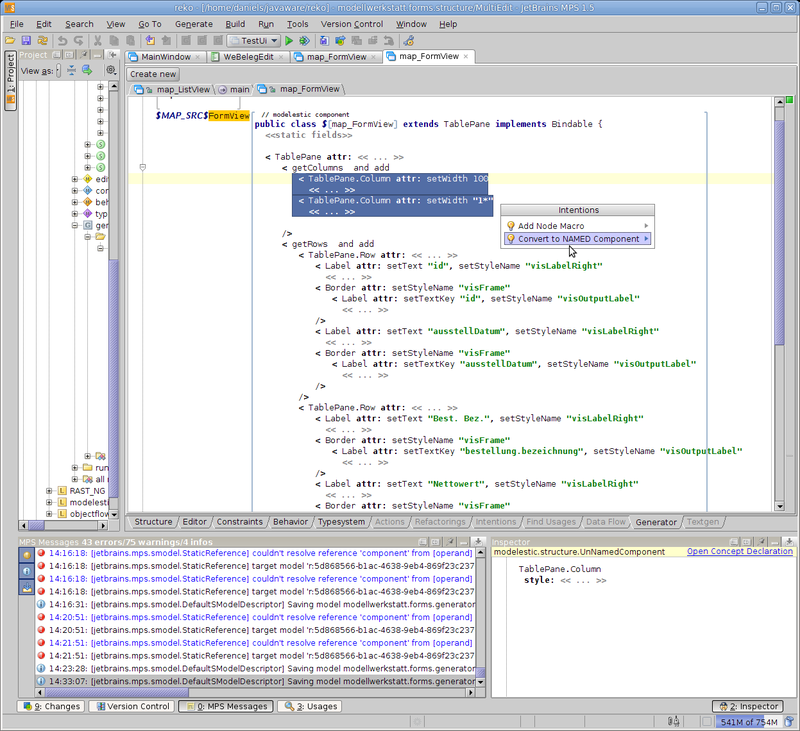 You can not put a Template Fragement macro over to nodes - like in the picture above. This is a current limitation of MPS templates. I'll try to explain the problem: any generator macros ($LOOP$/ $COPY_..) are represented in editor as "blocks" wrapping some syntactical constructions. In the same time in model those macros are stored as a child elements of the element they are wrapping. It's clear that it's not possible to create common (single) child element for two different target language constructions... So, you have to use two $LOOP$ macros there. In BaseLanguage we are using BlockStatement for such situations - you can create single macro "around" block statement and then put couple of elements inside this block statement. but you can have several Template Fragments as long as they are in the same parent node. indeed - good answer. I did not know that one can use more than one Template Fragment in the same parent node. This is at least one alternative solution to mine.